The creation of a mural featuring the fauna and floar of the local area. 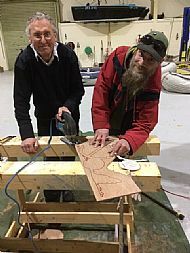 The pupils of Avoch Primary School designed the shapes which became the templates and the members of the Black Isle Men's Shed then created the wooden shapes which once painted, will be affixed to a board and displayed in the school. 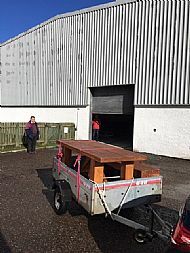 We were asked to build a table and bench for the Black Isle Cares organisation. The Old Ticket Office at North Kessock has been turned into a community hub by a group of local residents and they ask us to see if we could install a dolphin hydrophone in the building to allow visitors and locals listen to the animals which frequent the Firth. This has been achieved using a hydrophone at South Kessock. A laptop with specialist software, a 'dongle' based receiver and wireless speakers in the North Kessock building are in the process of being commissioned in time for the arrival of the dolphins in Spring.